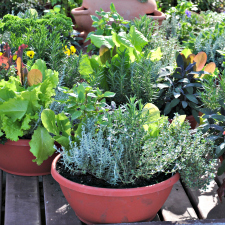 Vegetables, herbs and flowers can be grown in pots on a balcony or on the patio. All they need is at least 6 hours of direct sunlight, a steady supply of water and good quality potting mix. 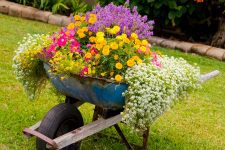 It’s easy to plant the same vegetables or flowers in each pot but you could try mixing them up. For example, you could mix flowers and herbs together in one pot or you could make combinations such as a Mediteranean mix which has basil, tomato and chives. Just make sure that all of the seedlings need the same amount of water and sunlight so that they all stay healthy. 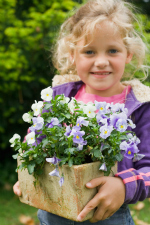 Choose a pot or container that is at least 20cm deep. The bigger the better! It could even be a wheelbarrow, a toy or dad’s old boot! They just need to have drainage holes in the bottom which an adult can help you with. Wear gloves. Fill the pot to 3cm from the top with premium potting mix. Water the potting mix so that it is saturated all the way through. Water the seedlings as well. Use a dibbler or a fat stick to make holes the distance apart that the plant labels suggest. Take the seedlings out of the punnets by pressing each cell from underneath until it pops up. Put a seedling into each hole and gently push the soil around it. 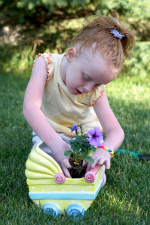 Make sure the top of the seedling rootball is equal with the top of the soil. Gently water the seedlings again. Water them every day and turn the pot around every week so that the plants on the other side get sunlight as well. TIP: If planting into a big pot, put it in the spot that it is going to stay as once it is full of potting mix it will be too heavy to lift. Seedlings that have been germinated in a tray and are now being separated and each one planted into a different pot so that they can grow larger.